“Kue Pais is considered healthy snack because it is clean-the banana leaves are cleaned first before use, because it contains carbohydrate from flour, vitamin from banana and fat from coconut oil”, said a woman who sells Kue Pais (banana snack) in the event she joined, the campaign for “Nutrition for Achievement”, on Sahabat Anak Day 2016 in Bogor. The woman can simply describe the nutrient content of her snack after she got the knowledge on healthy food’s 4B (Bergizi (Nutritious), Berimbang (Balanced), Beragam (Diverse), and Bersih (Clean) from Sahabat Anak’s volunteer. The problem of children’s nutrition fulfillment in marginalized family is often connected to the community’s knowledge and awareness limit on the important of nutrition. In fact, in several studies result presented by Banerjee & Duflo (2011) in Poor Economics, they found that the biggest problem lies not in the rarity of food but on the food selection. Families in low socio-economic level tend to choose food only from their good taste, not from the nutrients contained in them. In addition to that, most choose to spend money they have not for food but for other interests such as cigarettes, alcohol, or electronics goods that they feel more important to raise their self-esteem. The condition suggests that proper formation of lifestyles and daily decision making in marginalized families, including the selection of nutritious foods, becomes an important aspect for continual intervention. Therefore, to commemorate the 2018 National Nutrition Day, Sahabat Anak would like remind Indonesian families on healthy food’s 4B (Nutritious, Balanced, Diverse and Clean). With healthy food’s 4B, Indonesian children will grow healthy so they can reach optimal achievement for the progress of our nation and country, Indonesia. Happy National Nutrition Day! In honor of Friendship Day in 1998, Nane Annan wife of UN Secretary-General Kofi Annan, named Winnie the Pooh as the world’s Ambassador of Friendship at the United Nations. In 2011 the United Nations declared July 30th to be the International Day of Friendship, which signifies the unification of all people regardless of gender, race, religion, political views or geological positioning. Friendship between peoples, countries and cultures can inspire peace efforts and build bridges between communities. As adults we all remember our first childhood friend. The one we woke up excited to see inside the school gates. Play dates filled with adventure, confidences and laughter. As it remains, our friends are a hugely important part of our lives, from sharing problems, asking for advice, uncontrollable laughter and good times, sharing our life events and proudest moments, our friends help each of us define who we are. For children, making friends is a vital part of growing up and an essential part of their social and emotional development. Attributes such as social competence, altruism, self-esteem and self-confidence have all been found to be positively correlated to having friends. Studies have found that friendships enable children to learn more about themselves and develop their own identity. And, as children mature, friends are able to help reduce stress and navigate challenging developmental experiences, especially during teenage years. Today, our world faces many challenges, crises and forces of division, such as poverty, violence and human rights abuses, among many others. These undermine peace, security, development and social harmony among the world’s peoples. To confront those crises and challenges, their root causes must be addressed by promoting and defending a shared spirit of human solidarity that takes many forms; the simplest of which is friendship. Through friendship, by accumulating binds of camaraderie and developing strong ties of trust, we can contribute to the fundamental shifts that are urgently needed to achieve lasting stability, weave a safety net that will protect us all, and generate passion for a better world where all are united for the greater good. Young people, as our future leaders, have the opportunity be actively involved in creating a more inclusive, understanding and respectful societies by championing diversity and by welcoming friends from all walks of life into their lives and inviting diversity into their communities, cities and countries. Road to Bromo Marathon 2016! On Saturday, August 20th, Sahabat Anak joined Bromo Marathon 2016‘s runner briefing held by Indokasih in Gandaria 8, South Jakarta. Along with Sahabat Anak were also representatives from three other organizations: Yayasan Pemimpin Anak Bangsa (YPAB), Care4Kids Indonesia and Wahana Visi Indonesia. The purpose of this gathering is to introduce runners/fundraisers with the organizations they represent in Bromo Marathon later on September 4th, so they can understand more deeply the background of the fundraising. Why these 4 organizations in this fundraising event? The main reason is these four are concerned and engaged in education. 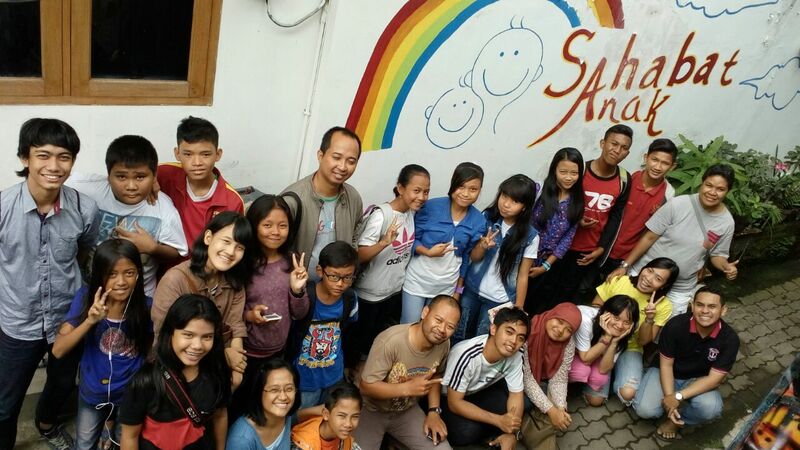 Yayasan Pemimpin Anak Bangsa is a free education foundation in Bintaro for the drop-out children from their school with fostering program. Runners who raise donations for YPAB wish for children graduated from Kejar Paket C (non-formal education equal to high school level) to be able to continue to higher education level. Care4Kids Indonesia runs a School Development Program to assist on school’s recovery by focusing on teacher’s quality, also school’s infrastructure and facilities. Runners who represent them will help Teruna Persada High School that most of its students are high achievers in sports but lacking in education. 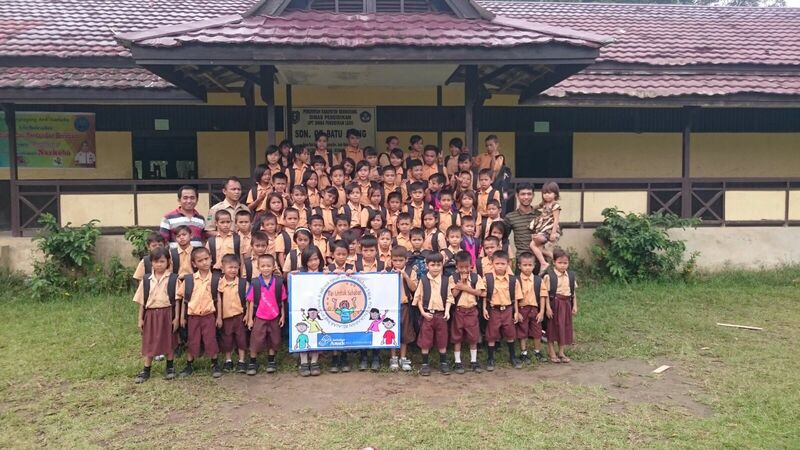 Wahana Visi Indonesia through their runners are raising donations to build an early education center in Samalantan village, Kalimantan Barat. Sahabat Anak, in line with our program this year, Gizi Untuk Prestasi (Nutrition for Achievement), will use the donation to increase awareness on child nutrition. Right after Bromo Marathon, the volunteers/runners will take part in SA roadshow in Malang to distribute lunch boxes and drinking bottles for children there and join other activities in the event that involve the parents. You can check here for the full list. The Tas Untuk Sahabat (bags for friends) program that was launched in March 2015 and ended in October 2015 ran smoothly. We would like to express our thanks to all our friends who participated. 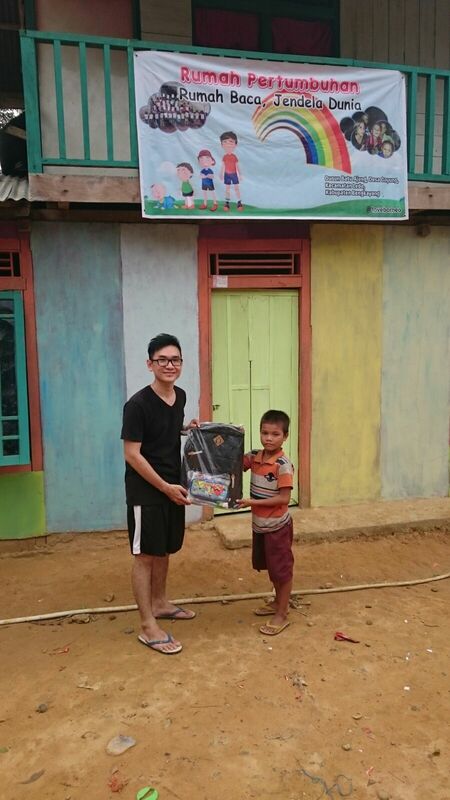 The bags funded by your 100,000 IDR donations have been distributed to targeted children chosen by Sahabat Anak’s partners – not only in Jakarta and its surrounding areas, but also to children in remote areas of the archipelago. The distribution was done in several ways, including through friends who purposely travelled to areas where some of the children live, or through others who had commitments in relevant areas anyway. Some bags were also sent to children, by land and sea. 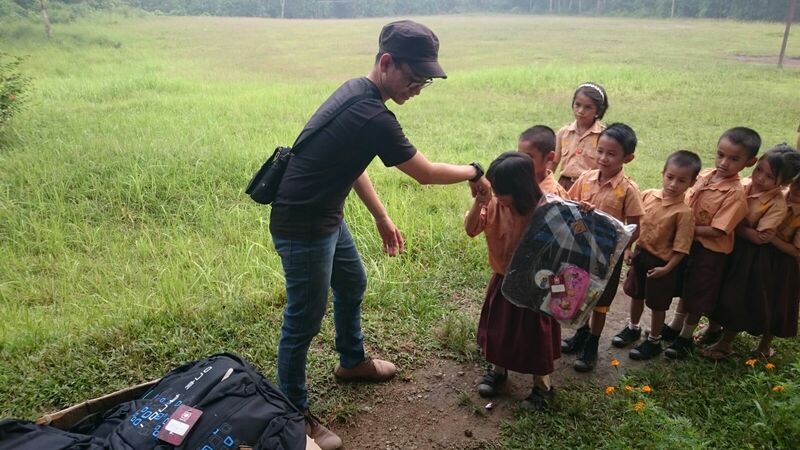 This program has been Sahabat Anak’s second program to reach out to rural areas. The Kutu Buku – Kampanye Untuk Berbagi Buku (Book Share Campaign) program that was successful in 2014 was our reference for doing this, a project with similar characteristics but in a different form. With the purpose of promoting education, books and bags were the immediate choices. We are hoping that through this donated gift, children will be more motivated to study, as their knowledge will increase thanks to the books and they will go to school in high spirits bringing those books in a modest but meaningful bag. 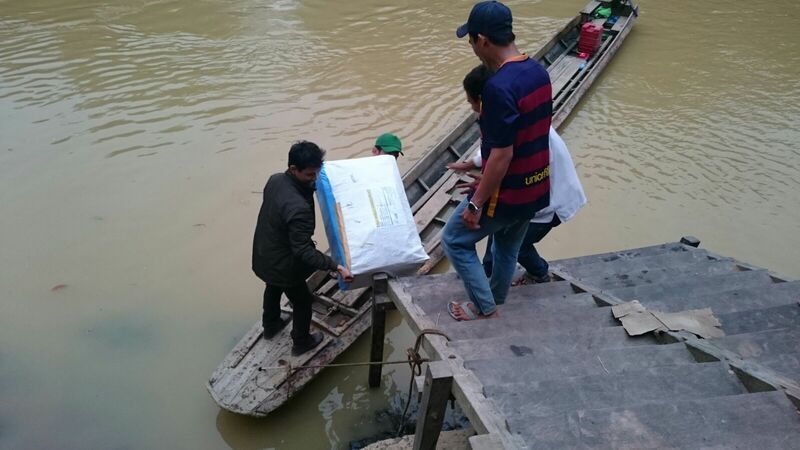 A total of 725 bags were sent to 8 rural areas in Aceh, Mentawai, Kalimantan, Sulawesi, Lombok and East Java. 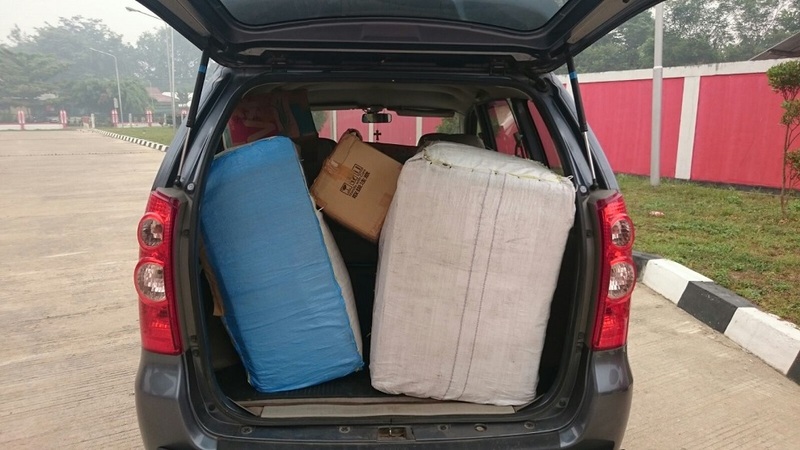 Furthermore, by the end of 2015 we had distributed another 200 bags to five of Sahabat Anak’s partners’ areas. We hope that this simple gift will be a good start to a long-term relationship with our friends who are pursuing the same mission as Sahabat Anak in remote areas. 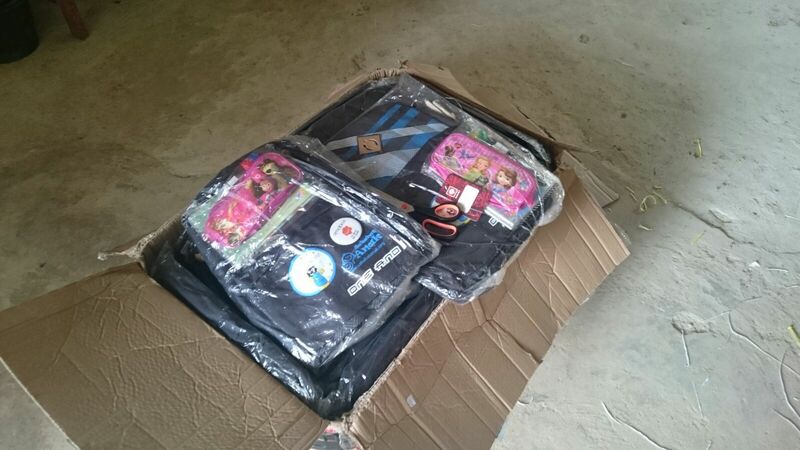 And we hope that children who have received these bags can feel the support behind them from all our friends who were involved in this program. Below is a report of recipient areas of Tas Untuk Sahabat. We named our community: Love Borneo. It’s a group of young people who has grown spontaneously; doesn’t have any chairperson or board of committee, but we have one vision that unites us, that is to share love to people in need. Our three main focuses are prisons, remote regions, and schools. We thank Yayasan Sahabat Anak Jakarta for partnering with us in opening Rumah Baca (a reading house / a library) in a remote region of West Kalimantan. The goal of this project is to raise awareness from the local society and its children on how important education is. 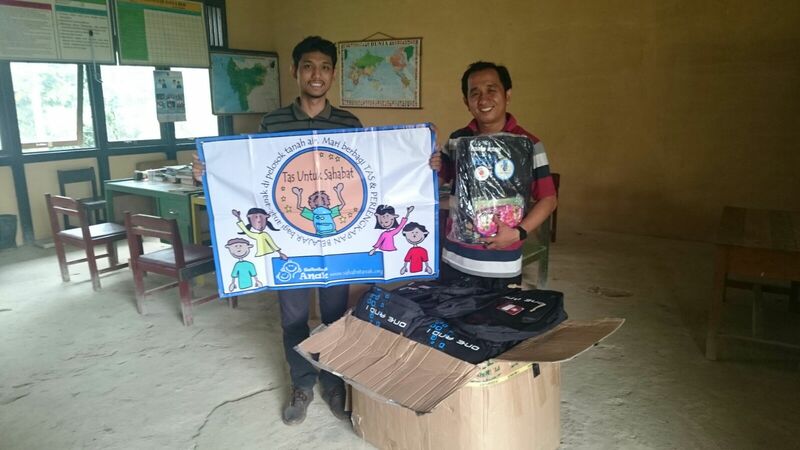 Sahabat Anak has also supported us in sending 80 school bags filled with stationery to the students of one Elementary School in Batu Ajung village, Dayung, Ledo, Bengkayang, West Kalimantan. The majority of the people there is Dayak Bekatik tribe. 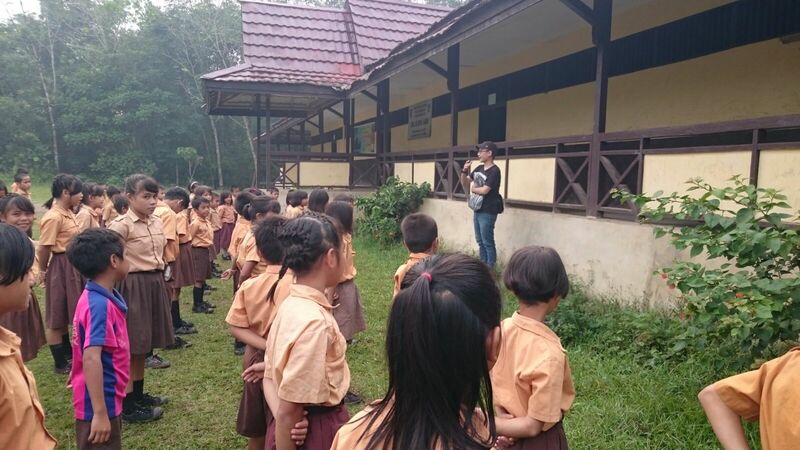 They use their mother tongue in their daily activities and Indonesian language in a formal setting of education. There are 7 teachers in that school, including the principal. Each grade has one teacher who teaches all subjects. To get to the Batu Ajung village is a long trip. From Pontianak (the capital of West Kalimantan) we will need about four hours with a motorcycle or a car to reach Ledo. Then, from Ledo we can reach Batu Ajung either with a motorcycle or a boat through a river. With a motorcycle, it can take up to 30 minutes ride on yellow soils which also hilly and bumpy. If it rains, the access will totally cut. The common access is by boat through the river that will take about 40 minutes. As soon as we arrived there, we will be greeted warmly by the local children. The village has neither electricity nor cellular signal. Most of the locals work as fishermen, rubber farmers, rice farmers, river miners, or laborers at the nearest palm oil plantation. The formal education available in the village is only elementary schools. The junior and senior high schools can only be reached in Ledo which takes about 40 minutes boat ride. Poverty and the challenging access have made the parents and the children (who have taken the elementary level) don’t take formal education seriously. The village itself is somewhat dirty and filthy. The river which supposedly becomes the source of clean water for the locals has become muddy as the result of gold mining; therefore the water is not drinkable. The villagers usually use the water from the spring or the rain for their daily needs. Their animals’ faeces can also be found all over the village which make it even dirtier. This condition has also made many of the children there have health issues. There are even children who can wear the same shirts for days. Being moved by the condition, the Love Borneo team has decided to help the villagers understand on how important to set their eyes on a better live and brighter future. We are committed to go to the village once a month (on the last weekend each month). Our team usually depart from Pontianak at 5 a.m. and continue with a boat at 10:30. During our time in the village, we give free Math and English lessons for students’ grade 3 to 6. For students’ grade 1 to 2, we teach them reading and basic counting. Some of our team members are professional nurses, and they are also willing to give a free health medication to the villagers. We stay overnight at the village and go back to Pontianak the next day because we have to work on Monday. Batu Ajung village is only one of the many remote locations in West Kalimantan that need serious caring touch for the sake of their future. 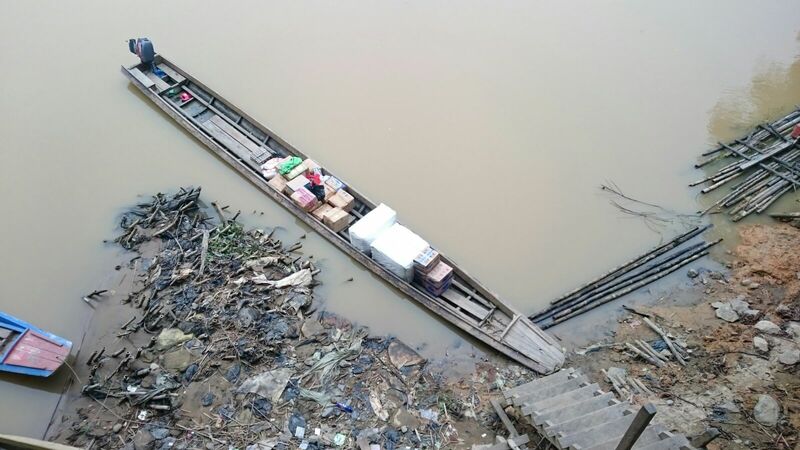 If we go through the river alongside Batu Ajung, there are still three farther villages with the same or even worse condition. We thank Sahabat Anak for partnering with us. The children there are very happy. The support given can help them to be more excited to study and go to school. We also send our regards to the whole team of Sahabat Anak in Jakarta. We look forward to your visit here. Those are the 3 most important lessons I have learned from the volunteers, but most of all, the kids at Sahabat Anak Grogol in the past 5 years. Their limitations do not stop them from dreaming. Their limitations do not stop them from trying to build a better life for themselves and their families. These limitations are simply obstacles in their path and can be overcome. Of course there are times when these kids fall into despair, but the volunteers at SA Grogol are always there to hear their problems, to support them and help them strive. To show them love. We live in an evermore self-centered and individualistic world. Having the opportunity to know these kids’ realities and being able to help at SA Grogol has been for me like a breath of fresh air, it has opened my eyes, heart and mind. I began my involvement with SA Grogol by teaching English and Maths to the kids there, and I am also involved in the Committee of SA Jamboree. My efforts and time seem infinitely small when compared to what I get in return from these kids and to what I have learned from them. In my profession as a model, I sometimes complain because of the long working hours, feeling tired and exhausted after a long day of work. A sudden panic attack because of a difficult stage or painful shoes. Then I remember. I remember how strong these kids are; their lives are truly complicated, filled with daily challenges regarding things most of us take for granted. Their spirits grow stronger and stronger, and that makes me stronger. It motivates me to push myself. 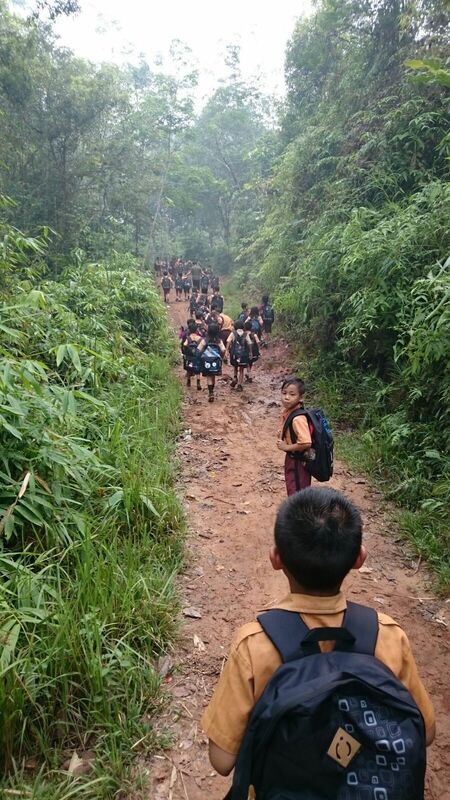 But the biggest motivation of all, the greatest satisfaction, is when I see these kids reach their goals. Bunga is now an economics graduate. Basiroh and Eka are now attending university and working to maintain themselves and helping their families throughout their studies. Muji has reached his dream of being involved in the cosmetics industry and is at the same time teaching dance to younger kids. There are others who are walking the path towards reaching their dreams and goals. These kids have managed to step out of their path and make their own. Some may say they were destined to be borned as street kids, but they changed that destiny and made their own life. As Lina Tjindra said, “Though there are some who stop in the middle of their journey, the success of 1 or 2 kids in reaching out their dreams makes it all worth it”. We are not able to help everyone, but we can begin by holding 1 small hand, walking together towards that dream, and together help in shaping a better nation. Because at the end of the day, it is all from us, by us, and for us. Let’s help them, let’s help ourselves, let’s help the future generation, by doing something simple. Something we all can do. I am Laura Muljadi and this is my story. Now is your turn to write yours. 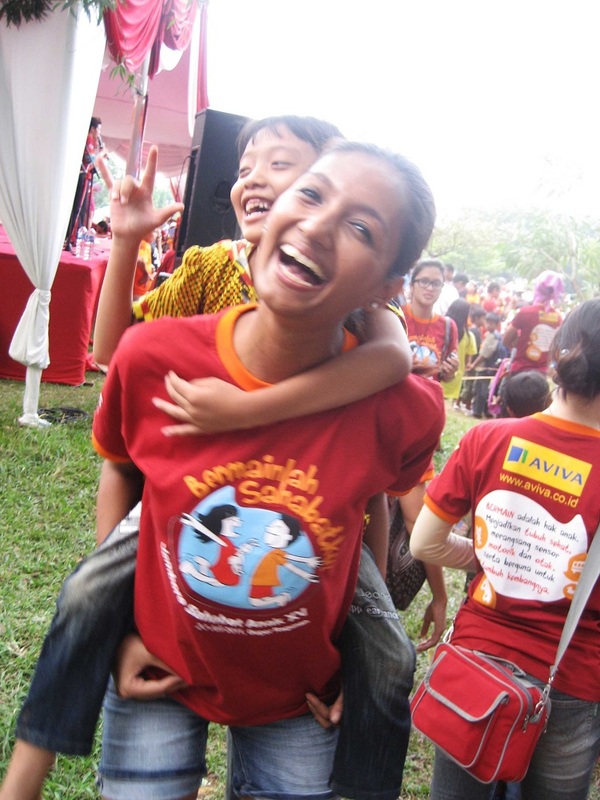 Usually the publication materials of Sahabat Anak are using pictures taken by volunteers and documentation team. The approach is changed this year. Instead, we will let the children to tell their own story from the pictures they take. “My Story, Your Story” photo project is Sahabat Anak’s pilot programme as part of 2016 calendar preparation process, by increasing the children’s role as their own subject and object. The first phase of this project was done on August 8th by conducting a photography workshop for the children. Technical briefing was shared by Kak Sri Sadono, Sahabat Anak’s PR team member in the Media section, to the children from various tutorial centers in Jakarta. 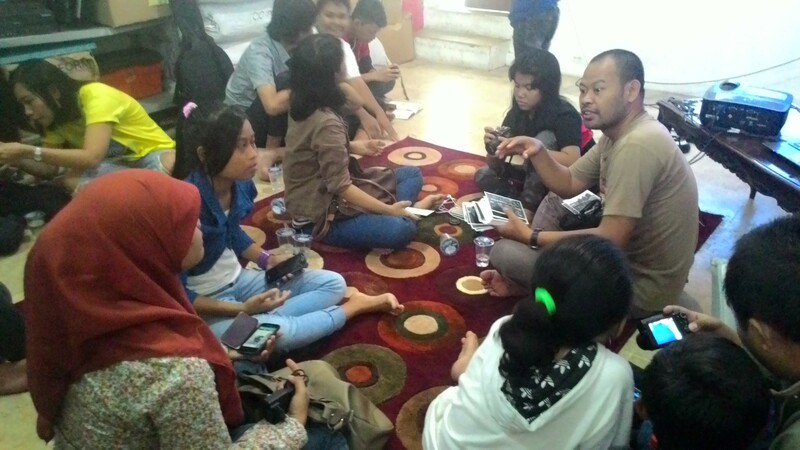 Kak Dono opened the workshop by sharing that storytelling can be done in several ways, one of them is through pictures. Why should the children tell the stories themselves? So that the stories can represent their personal experience better. Examples of photo object/ theme that can be taken are best friends, parents, their house, playground, their volunteers, class and schoolmates, also people who inspire them. The children also given tips on how to take good pictures, such as making sure photos taken have sharp focus and taken from nearby. To get good lighting, Kak Dono suggested taking photos in the morning or day when there is still sunlight. If indoor pictures are needed, make sure they are taken near door or window. For better story do not forget to take picture of the object with surrounding area. Some of Kak Dono’s pictures were shown in this workshop as sample for the children. After the Q&A session, these twelve children were lent cameras for two weeks. After they submit the pictures, we will go on with the next phase of this project, which is selecting their submissions.